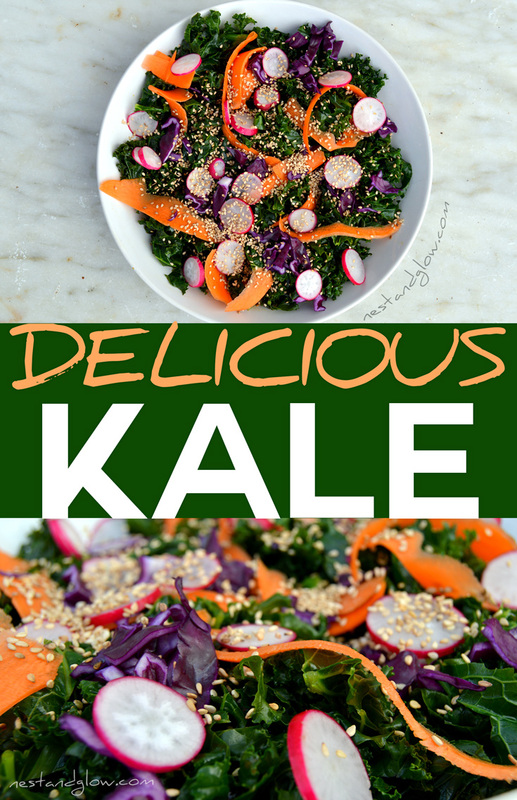 Try this easy recipe to get all the goodness of kale in a delicious tasty side dish. It takes a few minutes to make and is infinitely tastier than boiled spinach. Suitable for vegan, gluten free, plant based, healthy and paleo diets. Everyone knows that kale is great for you, it’s dark green leaves are full of vitamins and minerals. However many people struggle to eat it, so I invented this dish to make it more appetising. The kale is slightly steamed in order to break down the cell walls and make it easy to absorb. It has a salty sweet dressing from maple and soy sauce but you can replace either of these with something sweet / salty. 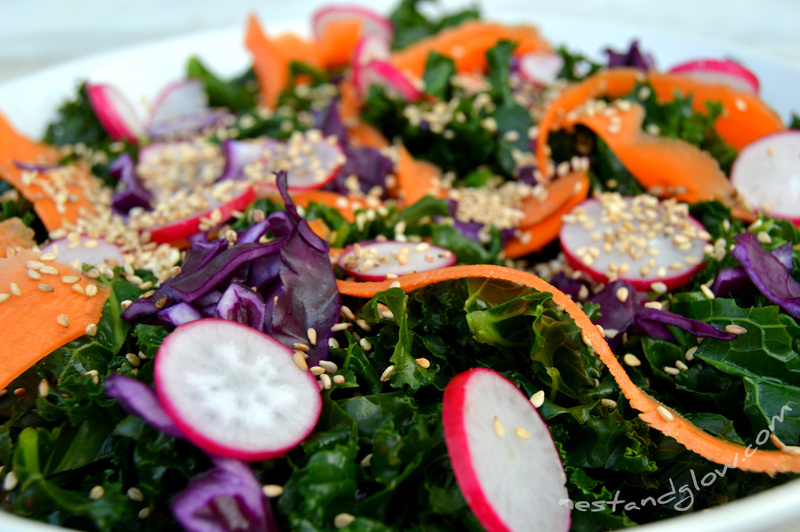 It’s adorned with raw radishes, carrot and red cabbage to add a bit of colour, crunch and more goodness from all of these foods. A few sesame seeds add an earthy nutty taste and extra crunch. If you’re avoiding soy just add some salt rather than the miso / soy sauce. Rip the kale off its stalks and slice into bite size strips. Steam the kale for 3-4 mins until tender. Put the kale in a bowl and sprinkle the soy sauce and maple syrup. Finely slice the red cabbage and radish. Use a vegetable peeler to make carrot ribbons. 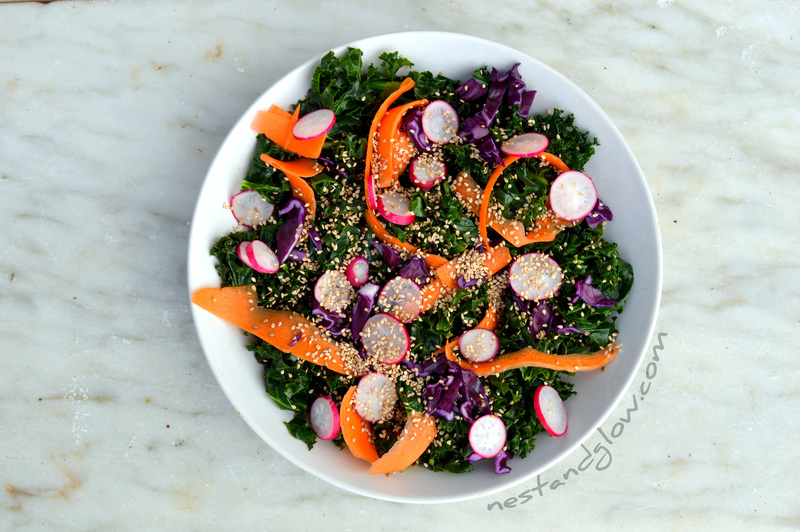 Sprinkle on the cabbage, carrot, radish, and sesame seeds and serve immediately. A great dish to have late at night when your hungry but don’t want anything heavy that is hard to digest and will interrupt sleep. If you want a raw version you can sprinkle on some cold pressed oil and lemon juice. Then scrunch for a few mins to break down the kale and once it’s half its volume it will be easy to digest.